At Island Pacific we build our systems around customer expectations and create seamless end-to-end solutions for your business and your customers. But making the right merchandising choices, driving revenue and managing inventory requires the right merchandising system. Island Pacific SmartRetail is the core of Island Pacific’s retail capability. Island Pacific SmartRetail is a series of modules that are available separately or as an integrated suite, offering retailers a feature-rich merchandising system combined with key retail life-cycle tools. Island Pacific provides the tools for retailers to manage their business. It is extremely flexible allowing a retailer to focus strategically across all of their channels and merchandise hierarchy or tactically at the lowest level of detail. The channel and merchandise hierarchy consists of several levels as well as business defined attributes all of which are prevalent and accessible for executing reports and business processes thus ensuring you have the maximum flexibility to manage the business. 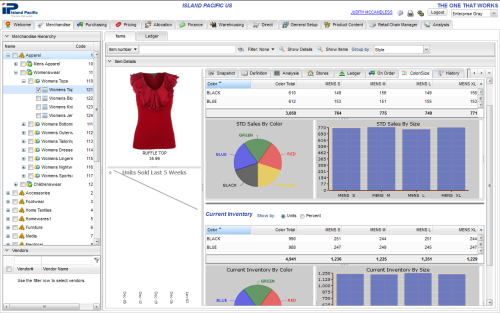 Island Pacific provides comprehensive tools for inventory management across all of your retail channels. Its stock ledger data has the highest level of integrity and is held in retail cost and units across every channel. With our various inventory management features the business can easily manage the physical inventory process and stock takes, manage stock adjustments and transfers, as well as producing stock ledger analysis and audit reports. Island Pacific’s purchasing process provides extensive purchase order management procedures for a retailer to manage the purchasing process within the business. Features include manual or automatic purchase ordering, purchase order approval processes, extensive purchase order reporting, supplier performance statistics as well as supporting multiple purchase order types, multiple currencies pre-split and drop ship orders and much more. As well, you are able to estimate landed cost factors such as freight, duty and other charges that add to the vendor cost. Conversely you are able to estimate and track various types of vendor allowances. Both of these estimated charges and allowances can be compared to the actual charges or credits in accounts payable. With Island Pacific Pricing and Promotions you can manage all the pricing activity across your inventories and channels. Extensive stock price management and promotional tools are available which support permanent and temporary price changes as well as the ability to create elaborate promotional and deal scenarios. Optimal efficiency is ensured with the use of price groups to allow the grouping of the stores and channels with the appropriate pricing strategy. Island Pacific pricing is also able to manage and control regional retail pricing for the same item across the chain. Island Pacific Allocation and Replenishment optimizes on Island Pacific’s 35 years of retail experience ensuring that regardless of channel the retailer has the right stock in the right place at the right time. With the cross channel Allocation & Replenishment inventory management capabilities you can set static stock levels of minimum, ideal and maximum stock levels by item and store; or dynamic stock levels based on minimum and maximum days of supply or replenishment calculations that react to historical trends and forward sales projections. Island Pacific Financials is a retail financial management tool that interfaces tightly with Island Pacific Merchandising and Island Pacific Warehouse for seamless invoice matching. With Island Pacific Financials you can manage your chart of accounts, accounts payable, stock ledger extractions, freight and duty expenses, month end and more. It also offers integration with third party financial packages. With Island Pacific Sales Audit you maintain control at every point in the sales audit cycle. You will be assured that you are receiving and processing accurate data at your head office, and you’ll have everything you need to manage your business, from line item transaction detail to multi-channel summaries. Island Pacific Warehouse is flexible enough to meet the demands of any modern warehouse. The Warehouse inventory manager can be operated using paper-based or radio frequency (RF) or voice picking functionality. It uses logical warehouse mapping to map your warehouse into zones, making the picking, putting away and storage of merchandise more efficient. Island Pacific Warehouse improves location accuracy, utilizes space, reduces labor costs and enhances efficiencies in both paper-based or barcode-based systems. You will be able to establish a full audit trail, from point of receipt to point of dispatch, for every item that moves through your warehouse. Learn more about the features and benefits of Island Pacific SmartRetail here. 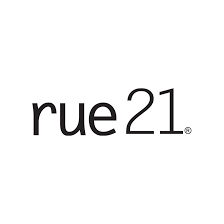 For a demo, or to learn more about our retail inventory management software contact us today. Manage your inventory and financial data across multiple channels and multiple locations from your central head office.